Greetings! The holiday season is upon us already… my how time flies. Last week was a flurry of assignments but with the annual slowing down of work around this time of year, I usually take some time to work on personal projects. This year is no exception. My good friend and mentor, Jody Ake moved to Portland recently and agreed to give me a refresher course on wet-plate collodion. 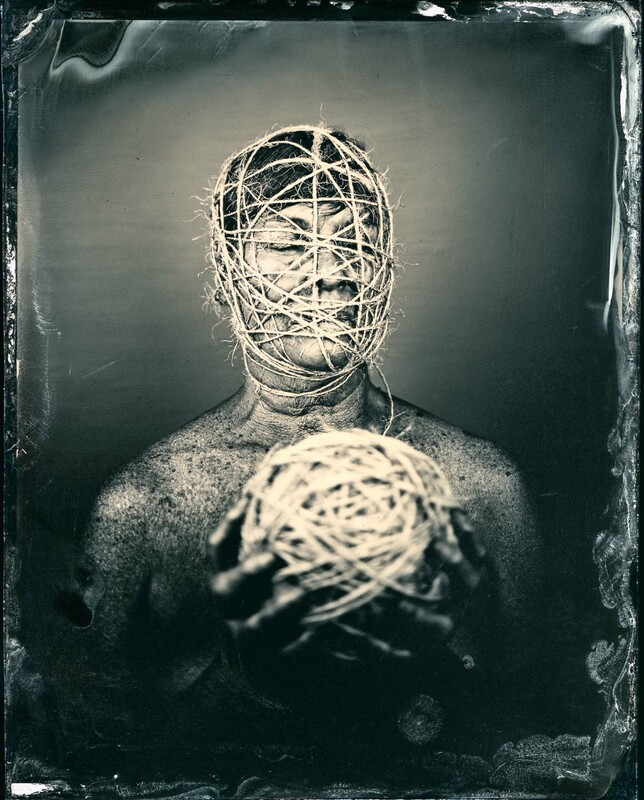 For a one-person show in 2009 during Portland’s biennial photo festival, Photolucida, I showed a group of 25 full plate ambrotypes – a study of birds nests that I created during a workshop in 2008 at the Oregon College of Arts and Crafts that Jody taught. This piece was also included in the Tacoma Art Museum’s 2009 Northwest Biennial. grid of 8x10" ambrotypes entitled, "Nest"
Since that show, I’ve been busily filling print orders and taking assignments and have not had a large enough block of time to get back into the wet darkroom… until now! Often I use my holiday card as a conceptually simplistic way to get my creative ball rolling again. I’m looking forward to continuing to work in the wet-plate process making not only ambrotypes, but also ferrotypes. Happy Holidays! The Center for Fine Art Photography in Colorado has announced the winners of the 2009 Art In Nature exhibition and my piece entitled “Nest” has been selected for the exhibition. The juror was Kathy Moran, National Geographic magazine’s first senior editor for natural history projects. It is a tremendous honor to have been one of the 48 artists chosen from three countries. The exhibition will be on display at the gallery from December 4th, 2009 until January 9, 2010. Nest #1 from the series, "Nest"
This post is not meant to be a gloatfest, but I must admit I am left feeling a bit gobsmacked by the amount of people who attended my opening at the Froelick Gallery last Saturday evening. It was incredible. I have to give a huge thank you to my Mom and her friend Susan Brody who assembled the catering for the event. Thank you to Photolucida for helping me promote the show. KC was our fantastic bartender and Karl, Rebecca and Charles all did an incredible job of keeping everything running smoothly. To have such a fantastic crowd during such a huge economic slump is heartwarming and makes me feel as though the tide has turned. The evening was full of friends, strangers, photographers, curators, collectors and writers. People took a leap of faith and purchased work. There was much rejoicing. Mike Davis and Deb Pang Davis sent me some photos of the event and with their blessing have allowed me to post them here. Thank you Mike and Deb!!! Deborah Pang Davis and Melissa Farlow in the center, my hubby on the far left.